A hilarious satire of the faults and follies of Britain's Lost Generation delivered with Waugh's signature wit. Failing writer Adam Fenwick-Symes and his on-again/off-again, wealthy fiancee, Nina, flow from country homes and auto races to parties, mingling London's decadent, if aimless, youth (aka Bright Young Things). Guaranteed to make you giggle in public. In the years following the First World War a new generation emerged, wistful and vulnerable beneath the glitter. The Bright Young Things of 1920s London, with their paradoxical mix of innocence and sophistication, exercised their inventive minds and vile bodies in every kind of capricious escapade. In these pages a vivid assortment of characters, among them the struggling writer Adam Fenwick-Symes and the glamorous, aristocratic Nina Blount, hunt fast and furiously for ever greater sensations and the hedonistic fulfillment of their desires. 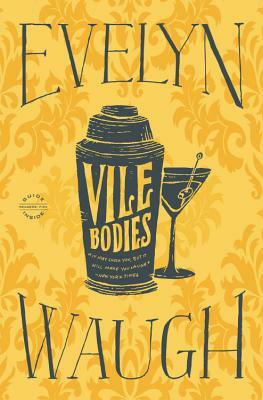 Evelyn Waugh's acidly funny satire reveals the darkness and vulnerability beneath the sparkling surface of the high life.